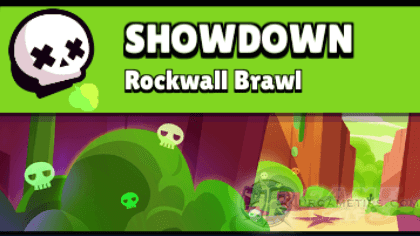 Here's some quick tips and guide on how to survive and win Brawl Star's Showdown event mode (Rockwall Brawl Map), in the fast-paced multiplayer online battle arena mobile game app for Android and iOS players. - 2 players for every sides of the map forcing them to fight for Power Cubes. The other 2 will spawn at the center which is more advantageous if there are lots of Boxes. - Spawns randomly from those usual spots, even the center area can have a lot or with only few boxes. No corner boxes but 1 box may also spawn near those wide bushes. - Some Boxes located at the sides near those spawn points are somewhat covered with walls and skulls, be careful not to get trapped here when breaking these boxes, mind the incoming poison clouds. - Corner areas got some wide bushes, a nice place for melee Brawlers to hide early on. Other than that, bushes here are limited so scouting would be a bit easier. Lots of walls too, so expect Throwers to play here as well. - Grab Power Cubes as fast as possible because this map forces you to compete for Power Cubes. - Once you are done or most of the boxes are gone, quickly go to a safe area, preferably near the corners. Wait for ambush opportunities (for more Power Cubes) while hiding, or wait until there are only around 6 survivors left, before going a bit aggressive (better for ranged Brawlers). 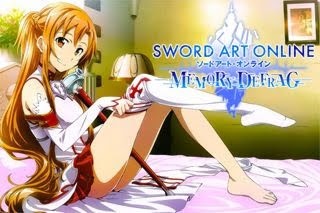 - Most of the time, the end game would be a 4 or 5 way stand-offs, so having a range and decent HP is an advantage. Plus, they would usually go and kill off low HP Brawlers first. - I would also suggest Jessie and Penny here because of their ability to use boxes to attack enemies! Their normal attacks are also good against teamers since they love to stick together, but still be careful though because these guys are squishy. - Be aggressive, sneaky and use your attacks accurately. - Example: If you spawned near the sides, move away a bit until the immunity barrier disappears (to let them think you went away), then quickly go back to harass while hidden from those bushes, be careful though make sure that your target is going for the boxes first). 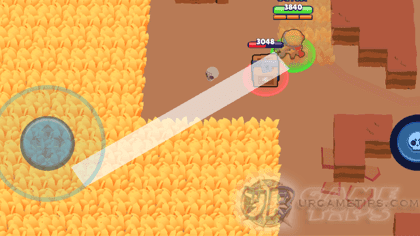 Another way is to move and let them have the boxes, wait for them to come closer, then go back and spam your attacks (use manual aim if needed to target nearest box to the target). - Note: If you can sink all Penny's 3 attacks using a box, you can possibly instantly kill a Bull! - Once you are done or most of the boxes are gone, quickly go to a safe area, preferably near the corners. Wait for ambush opportunities (for more Power Cubes) while hiding, or wait until there are only around 6 survivors left, before going a bit aggressive. - Keep your turrets coming, best if there are only few Throwers to keep them safe. If there are too many Throwers, better stay hidden and let them do some of the killing. - If available, use your turrets as shield or when being chased to redirect their auto attacks. - Once those poison clouds closes in to the center, take cover and use your turrets to help you out. You have lower HP so they might target you first, so pick your fights well and quickly lower someone else HP. - Note that Jessie's normal attacks (after hitting a box or an enemy), will most likely bounce to the nearest enemy or box regardless if it's hidden or not, so use this to determine the locations of your enemies. 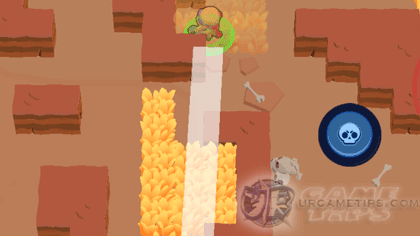 - Example: The screenshot above shows that you can scout that wide bushes by only using 1 attack! If the bounce goes to the bushes, that means you have an enemy lurking inside, but if it bounces the other way, then you can safely hide there. Best done once the poison clouds kicks in to close the paths from the sides.